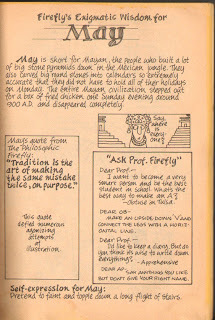 Way Out Junk: OGF Wisdom for May! I hope you guys are enjoying these quasi-educational tidbits from the good Professor Otis G. Firefly. I would like to know if anybody tries the self-expression suggestions (although I wouldn't recommend the one for this month)!